Horlicks has been made since the days when sailing ships plied the world's oceans bringing exotic goods from the far flung corners of the world into British ports. Horlicks is a malted milk drink made from wheat, malted barley and milk. It is a rich source of vitamin D which is an essential aid to calcium absorption. Horlicks is caffeine-free and contains no artificial flavours, colours, sweeteners or preservatives. Horlicks is traditionally used as a bedtime drink. Its sweet, malty flavour will lull you into a nice relaxed mood ready for a good night's sleep. 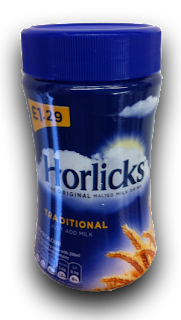 A 200g jar of Horlicks is just $3.99 at Blighty's.